Thanksgiving is always a perfect excuse to pull out the pie pans and make an array of holiday pies. 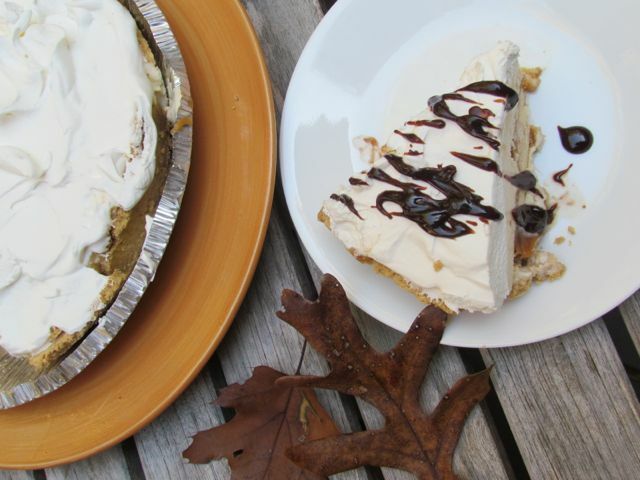 From Baked pies like Pumpkin to no bake pies like the pumpkin pie ice cream pie I will be sharing today there is sure to be a holiday pie below that will satisfy your sweet tooth. I remember one Thanksgiving a few year ago, I made 7 different pies. I just could not stop making them when I came across a recipe that looked amazing. This year I will be making a pumpkin pie, a pecan pie and new to the arsnel Pumpkin Pie Ice Cream Pie. What is on your dessert menu this holiday season? 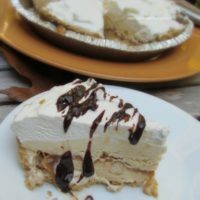 This Pumpkin Pie Ice Cream Pie could not be easier and it actually makes 2 pies so you have plenty to spare. I purchased the Pumpkin Pie ice cream at our Fresh Market Store, but you could use any pumpkin ice cream you can find on the market. I also used a caramel sauce, the one at Fresh Market had cinnamon in it, but I think any high quality caramel would work. 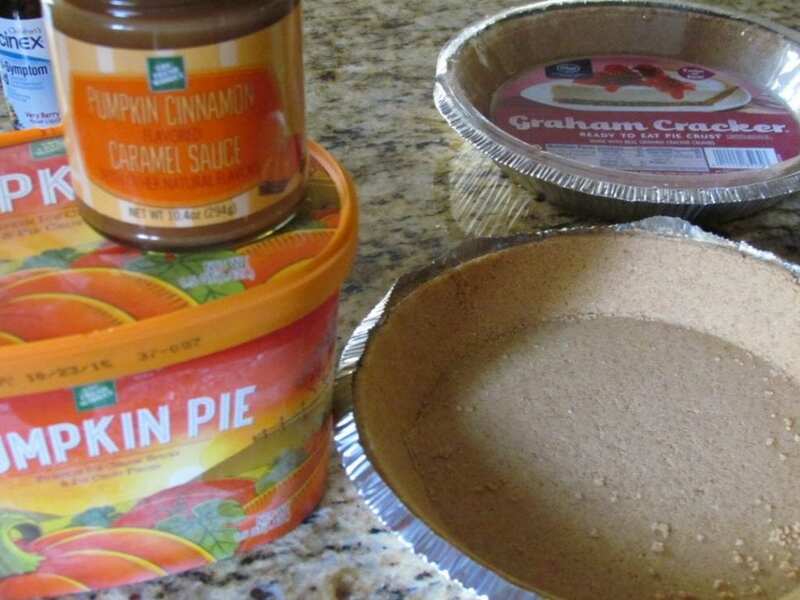 Also you need a graham cracker crust, just buy two at the store for an easy holiday pie recipe. Oh don’t forget the whipped topping, Cool Whip does the trick at our house for things like this. I only serve freshly whipped cream with the other pies. Allow the ice cream to soften and spread 1 1/4 cup of ice cream into the bottom of your crust. Allow it to freeze for 20 minutes. Spread half of the jar of caramel onto each pie and freeze again. Spread another 1 1/4 cup of ice cream onto the pie. When frozen, top with half a tub of cool whip. I used the cover of the pies to cover the pie and keep in the freezer until you are ready to serve. Take out the pie at least 10 minutes b/f serving for best results. I enjoyed heating up some hot fudge and drizzling onto each piece for a little decadence. I love pie. I mean I really love pie! Oooo~ That is a delish idea. Never would have thought of that. Will have to make this. This would be a great alternative to the traditional pumpkin pie which we always serve with lots of whipped cream anyway. This looks really good. I was thinking about ordering a pumpkin ice cream pie from Cold Stone Creamery. But I just might have to make this instead. This looks delicious. It is perfect to make now since the holidays are so close. That pie looks so delicious! I would love to have a slice of that. I’ve never had the Pumpkin Pie Ice Cream Pie, but it’s looking real good. May be the “new” food to add to the list this Thanksgiving. I’ll be trying this one out for SURE! I love the idea of an ice cream pie! And as long as it has caramel I’m good! Great tutorial recipe! You had me at pumpkin…Wow does that look delish and perfect for Thanksgiving! The ice cream pie looks delicious. My family would love this – great additional to our holiday pies. Pinned to my dessert board. I like to make sweet potato pies during the holidays. It is a great family tradition. 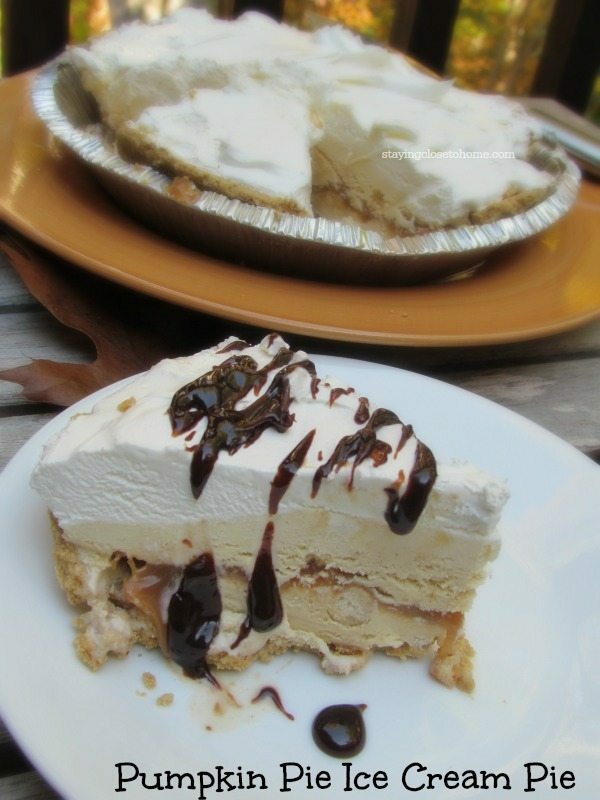 The no bake snickers pie looks so good, what a treat this would be! Awesome collection of mouth watering pies here. Love pumpkin treats, never had pumpkin ice cream before. This sounds amazing! What a wonderful pie recipe! I will have to try and make this. It looks so delicious and my family loves ice cream pies! This pie also look easy to make. Pumpkins pie ice cream cake sounds amazing! I will definitely have to try this! I love pie. Apple, blueberry, pumpkin….you name it. I love them all. 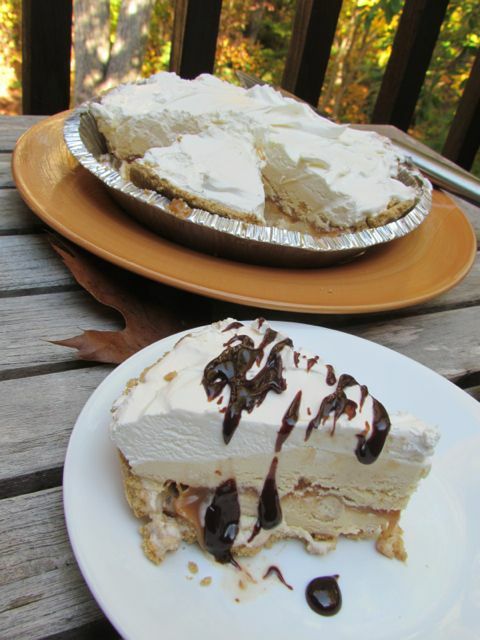 An ice cream pie is a delicious idea! My family doesn’t like pumpkin too much, but I would love to make something like Mint Chocolate Chip ice cream pie!